People talk about a global conspiracy, about the powers that own the world, but they don’t seem to grasp just how big the world is. How remote parts of the world are. And this isn’t just like, people living in the mountains. We’re talking about places like, Idaho. And Nebraska. There’s a lot of nothing going on over there, and do you think the conspiracies that run the world care about it? Well, you know they do. Because taking care of these boring places is your job. You are one of the nobody drones of an embarrassing conspiracy, taking care of the nonsense they don’t care about, and you do it in part by hanging out with this conspiracy theory group, seeing what they already believe about your particular plans. Represent CIA Interns, Local TV Illuminati, The Sasquatch Empire, or extremely Bored Aliens! Area Control, But Very Silly! A copy of Push-pins includes 50 cards, 2 of which are facing cards. Push-Pins needs a space players can play, which can be a whiteboard or corkboard. Players don’t need to shuffle, or even play at the same time as one another. Games can take place over a day in an office, for example, or play out quickly in one spot. For international customers, you may prefer to buy print-on-demand via DriveThruCards (the same printer we use for our local stock). 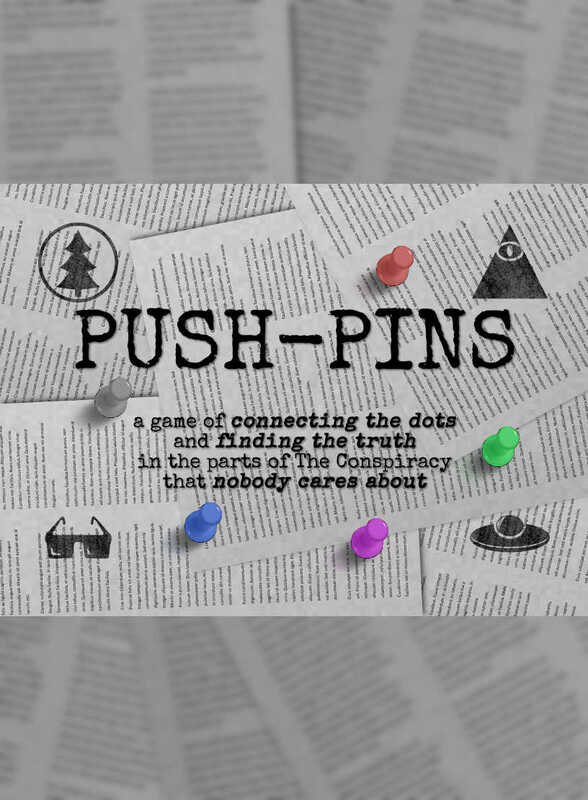 You can buy Push-Pins at DriveThruCards as a professionally printed card deck. But also, if you want, you can buy it as a print-and-play game, or even just download it for free if you want it here! Already bought Push-Pins? Download the latest revision of the Push-Pins rulebook. You can also follow us to receive notifications of rules updates!